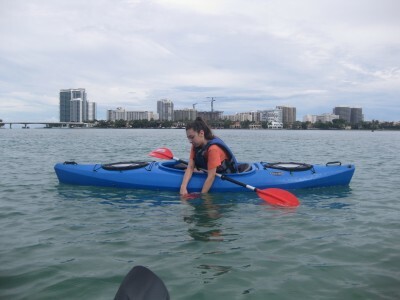 Rebecca Rauch-Thane, a dual enrollment student at FIU from Miami Beach Senior High School, is on a mission to improve the health of Biscayne Bay. Northern Biscayne Bay has been affected by sewage release, bulkhead construction, dredging and the creation of artificial islands throughout the past century. Federal officials estimate the bay has lost 82 percent of its mangroves, according to a Miami Herald article. Looking to moringa trees as a means to improve Biscayne Bay’s water quality, Rauch-Thane treated samples of water with moringa seeds. The dual-enrollment student found the seeds purified and clarified the water, effectively reducing its cloudiness and phosphorous content, while also stabilizing nitrogen content and salinity levels. FIU dual enrollment student Rebecca Rauch-Thane collects water samples in the estuary adjacent to FIU’s Biscayne Bay Campus and Oleta River State Park. Mangroves are important to South Florida because they protect coastal areas from erosion, storm surge and sea level rise. They also provide feeding, breeding and nursery grounds for a variety of fish, birds and other wildlife. Under the mentorship of Nick Ogle, environmental coordinator in the FIU School of Environment, Arts and Society, Rauch-Thane collected red and black mangrove propagules from areas in the bay where they would not grow. She then grew the propagules in the water treated with the moringa seeds and observed significant growth and survival rates in the mangroves. Moringa trees, also known as a drumstick tree, ben oil tree, benzoil tree or horseradish tree, are a fast-growing, drought-resistant tree native to southern Asia. It is widely cultivated in tropical and subtropical regions throughout the world. Rauch-Thane hopes to expand upon this research to countries where malnutrition is common and water purification resources are limited such as Asia and Africa. Rauch-Thane’s moringa tree project placed fourth in the high school senior section of the “Environmental Engineering” category of the State Science and Engineering Fair of Florida. It is one of various projects she has conducted to find solutions to some of the community’s pressing environmental issues. Rauch-Thane has studied soil contamination in Key Biscayne and Virginia Key by examining coconut water for pollutants that may have entered through the root systems. In 2015, Rauch-Thane was awarded a full scholarship to FIU midway through her freshman year at Miami Beach Senior High. What’s interesting is that it is actually the seed pulp that purifies the water. So perhaps the leftover pulp from companies extracting the oil from the Moringa seeds can be saved then donated for use in environmental cleanup projects. What companies extract the oil for the Moringa seed? Is there any environmental cleanup projects we can volunteer for that are on going or coming up or that we can start?